Happy Thanksgiving! May you feel warm, safe, and maybe floaty this holiday, as if tucked into a blue tulle sky. This photo, I'm alive, by Savannah Daras, comes from her solo feature at Escape Into Life, and today accompanies a sad but calm excerpt from the journal of Chris Al-Aswad, the founding editor of EIL. Look for a Thanksgiving message from Chris's father, Basel, at Escape Into Life tomorrow, Thanksgiving Day. I am thankful to have met Chris and Basel and to have become a contributor and then an editor at EIL. And, of course, I'm grateful to be alive on this beautiful earth under this beautiful blue sky! Or, here in the blog, this beautiful purplish sky! Now I want red hair. And pumpkin bread.The pumpkin bread is baked. And wrapped. 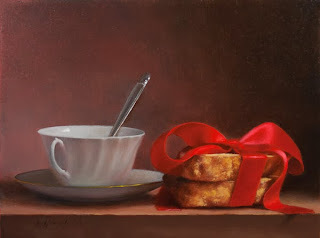 And be-ribboned, and ready to share with family wamily!! Once again, I have failed to get 100 rejections in the 100 Rejections project. This year, I even failed to send out 100 packets of poems, sending out only 90 instead. The tally: 39 rejections (so far; they are pouring in here at year's end), 20 acceptances, 28 pending, and 3 N/A (lost, something weird, etc.). It's sort of a slump. Of desire. Meanwhile, the earworms just keep coming. You might like "A Lovely Bunch of Coconuts," as sung by a young Merv Griffin at YouTube! But I keep hearing "The Love is Gone" (aka "When Love is Gone") from The Muppet Christmas Carol (on the VHS version we have but not in the version shown in movie theatres), because when I got home from various errands today, "The Tree Was Gone" (aka "The Tree is Gone"); that is, the tree that fell into the back yard during the recent storm has been chopped up into wood chips. ...away on little cat feet. Seriously, I'm having a real Blue Monday here today. Lovely snow flurries for a while, bitter cold, much uncertainty, a health crisis in the extended family wamily, the usual anxieties about holiday travel and holiday gathering---all inside a more general sense of, indeed, my cup running over with love. So that's good. 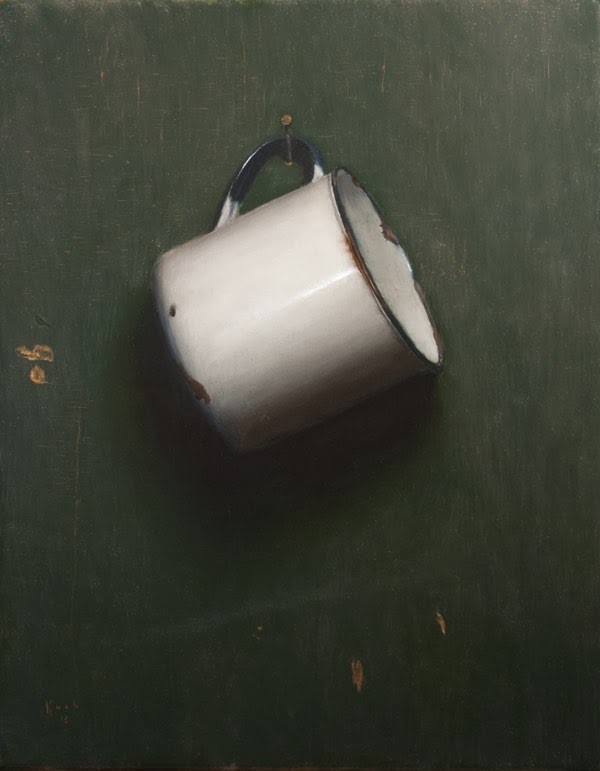 This Enamel Cup is one of the new works by Jonathan Koch, an artist I love from afar. Maybe it's the after effects of reading this theatre review from our new theatre writer, Scott Klavan, over at Escape Into Life. He saw No Man's Land, by Harold Pinter, at the Cort Theater, starring Patrick Stewart (also loved from afar, oh, Captain Picard!) and Ian McKellen. I've been seeing fun pix of their NYC antics, but the review is about the play itself. As Klavan asks, "Are we poets, and so, kings? We sure hope so. Or are we supplicants and ignoramuses, knaves and slaves? Oh, how we hope not." Maybe it's the gray sky. Or maybe I just need some Tea and Biscuits. 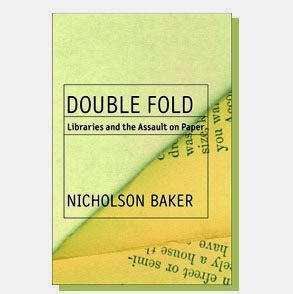 Remember when I fell in love with Nicholson Baker and said I would have to get hold of Double Fold: Libraries and the Assault on Paper, his book about saving bound newspapers and other written materials on paper instead of pretending that paper is brittle and decomposing before our very eyes and thus microfilming stuff and just disposing of the originals any which way? Well, I looked up, and there it was on the shelf over my computer, with other books in the I-love-this, I-need-to-read-this-soon, and/or I-am-in-the-middle-of-reading-this (because it is essays, or interviews, or chapters on a topic) categories. So I read it, and I liked it, and I have always hated microfilm, but now I hate it even more. What a wild story about libraries and chemicals and the military and explosions! It's from 2001 (and a first edition--hey, don't assault my dustjacket!) and publishing and technology have already moved off into the digital world, but I still love books that are books that I can carry around the house and leave in stacks here and there and forget, for a while, on the shelf over my head. And even this nonfiction book on books and libraries has moments of hilarity, just like The Anthologist and The Fermata, the two novels of his that I've read so far. 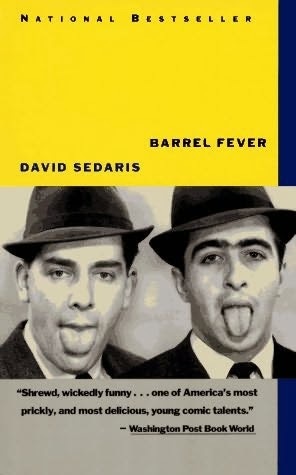 Speaking of hilarity, today I reread "SantaLand Diaries" by David Sedaris from Barrel Fever for the upcoming meeting of book group. There will be a Christmas tree, and maybe James Taylor in the background (as a Sedaris counterweight). Anyhoo, it's cold here! 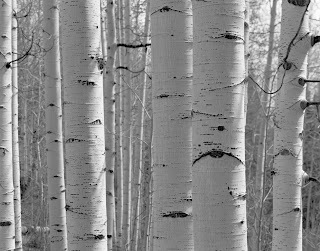 Well, I still have trees on my mind. And there's still a sideways tree in the back yard. The maple, oak, and tulip poplar in the front are still standing. 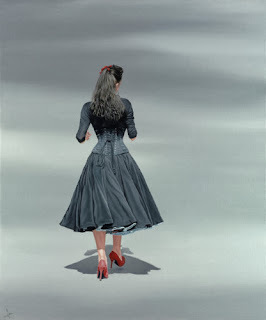 And I have a poem called "Aging in Oak" up in the new issue of Jet Fuel Review, "a high octane literary journal." Here it is, along with "Jumping the Shark," about a fall my mother took in Florida a while back, and, uh, Björk, and the tv show Happy Days, among others. Hard to explain how my mind works, but if you've ever been here before, you have a clue. The oak I'm aging in is a barrel, and I'm wine. It's a sad day, the 50th anniversary of the assassination of John F. Kennedy, and I remember it. The end of Camelot. It helped, last night, to see Spamalot at Community Players, local talents hamming it up, me laughing it up. Laughing is good for us. Assassination is not. Nor is assassination of character. Sigh, Facebook, shut up. Which reminds me, the host for Thanksgiving this year has asked straight out that no one discuss religion or politics. It's such good advice, and hardly anyone takes it. But she's asked, so I hope everyone will honor her wishes! I'd be grateful for that. 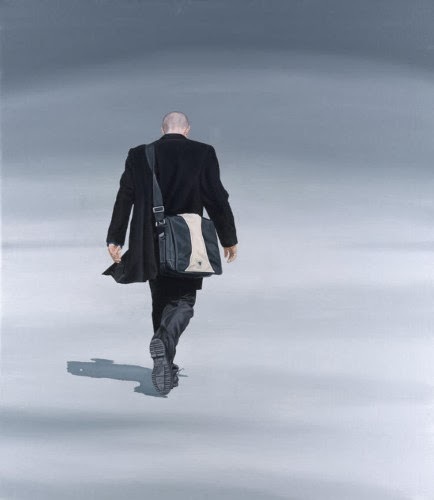 How about this great art by Nigel Cox? 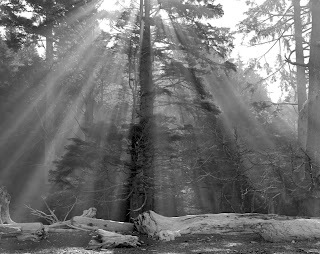 The humans are so solid and real, the landscapes so surreal, and the shadows so precise, calling it all into question. This art seemed perfect to pair with Dave Awl's poems today at Escape Into Life, letters and "night diaries." Poems that create relationship even as they expose solitude. Just like the paintings! I love my job. My labor of love poetry job. Well, we have our Christmas tree! Accidentally on purpose and early. Today my husband and I worked in the sunshine chopping up the snapped pine tree in the yard, and taking down the remaining branches. Trunk and roots will have to wait for another day and heftier equipment. We have hunks of firewood, branches ready for the city to take to its compost heap, and the Christmas tree--the top of the pine, saved for this purpose, to honor it. Some of you know that I leave the Christmas tree up for rather too long, but only when it is artificial. This one is up early and will go down early, too, by necessity, I imagine. But it is so fresh and smells so good that I think it will make it to Christmas. If not, we will have loved it for a while longer. Heart goes out to those in Washington, Illinois and East Peoria and many communities in the Midwest hit so hard by the storms. Heart still out, hovering, in the Philippines. 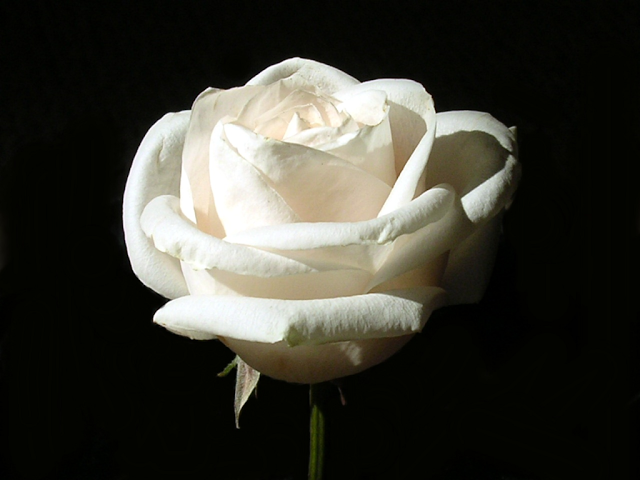 Our hearts hover together, a cloud of love and sympathy, that sometimes rains down some practical help. Thank goodness. 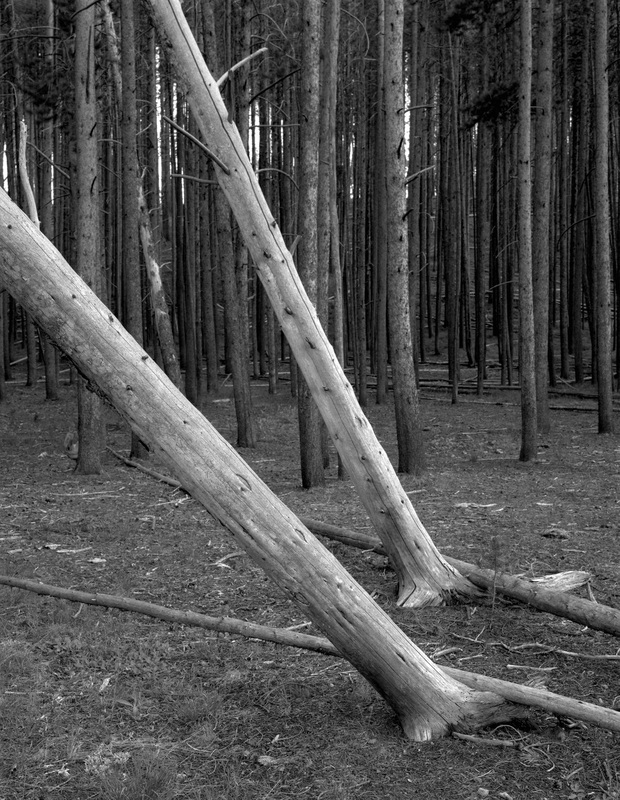 Again, in honor of the fallen trees, images by William Lemke. You can see more here and here. What a wild weather weekend. (And now a sky Blue Monday.) Illinois was hit hard with the bad storms that hurried across the country yesterday. A pine tree snapped in two in our front yard, and our neighbor's tree fell over into our back yard, crushing the fence. But we are fine and feel twice-blessed, as something similar happened (and at a similar tree-to-fence-to-yard angle) some years ago at a house in Chicago! That time, the tree narrowly missed a second-floor back bedroom where my husband was working. This time, my husband had just come in from cleaning the gutters (realizing while he was on the roof that this was a really bad storm) and was looking out the patio doors into the back yard when the tree fell into it. I was in the church basement, where we had gathered when the alert came through via cellphone (and did you know that a cellphone can have "Assisted Light" on it, a very bright flashlight?! Well, now I do!). We cheerfully continued our fellowship and then went home to our various messes and power outages, glad to be alive. 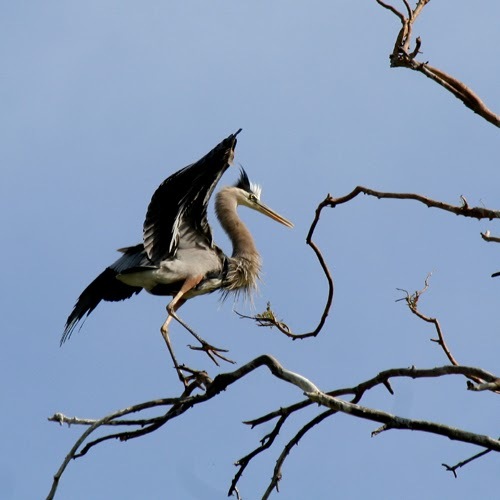 A poem of mine went up at Heron Tree, and I found it there this morning. And I found this heron landing on a tree at birding information. The poem is about a tree. A sweetgum tree! We have one in the back yard, and the neighbor's tree missed it as well as the house. Today we put out more leaves for the leaf-sucking machines, creating room on the median for branches. 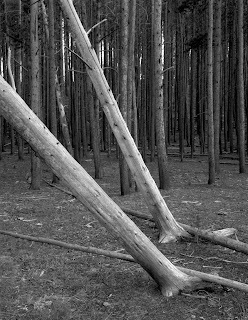 Tomorrow, perhaps, we begin chopping up the pine tree. Today, I made a wreath with some of its branches. 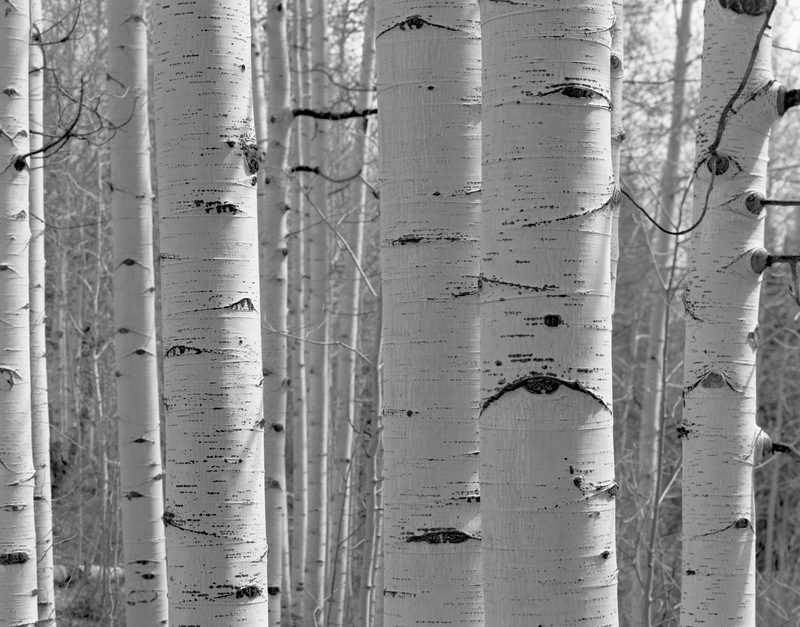 And, if you didn't see these already, take a look at William Lemke's photographs of trees at Escape Into Life. Please take a look at the new Artist Watch feature at Escape Into Life! 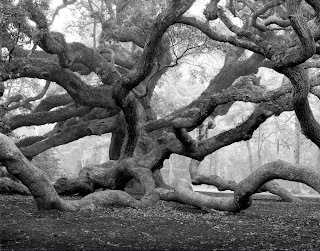 Photographs of trees, including this beautiful Angel Oak, by William Lemke. Can't you just imagine living in this tree? Well, so could Truman Capote, who wrote The Grass Harp, about living in a tree. It was adapted into a play, a musical, and a movie. 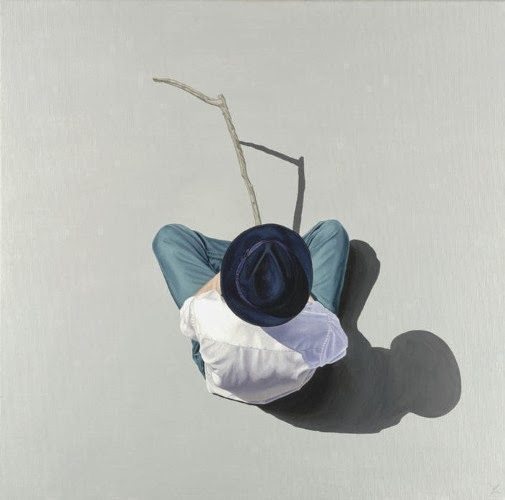 And Italo Calvino wrote The Baron in the Trees, about a boy who climbs up and does not come down. And Carly Simon sang about "Boys in the Trees." But I just like the tree, as is. Ah, I remember learning of the Portuguese word & human emotion, "saudade," and, more recently, the Welsh word, "hiraeth," for a similar emotion akin to nostalgia. 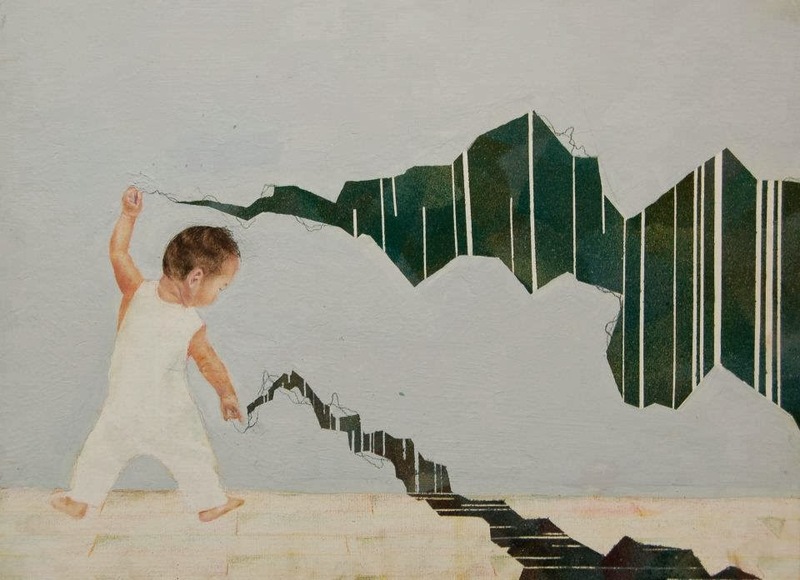 Saudade is a sort of longing for an absent someone or a missing something, that maybe no longer exists at all, or never did... Hiraeth is sort of a homesickness for a home that no longer exists, or perhaps never did... See how they are like nostalgia? And see how they are linked by melancholy longing? And you know I am of a melancholy nature! And that I love words. Anyway, I used both words in this review of Darling Hands, Darling Tongue, by Sally Rosen Kindred, a chapbook that revisits Neverland and its inhabitants and visitors, Peter Pan, Tinker Bell, Tiger Lily, Wendy and her brothers, and the Lost Boys. Here is another "lost boy," missing Naples in Saudades de Nápoles, by Bertha Worms. 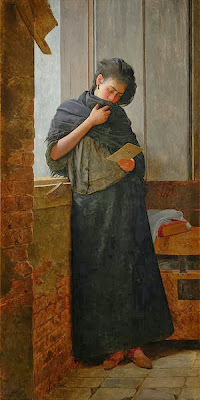 (And above is Saudade, by Almeida Júnior.) And did you know there are a jillion movies called Saudade, or with "saudade" in the title, at IMDb? One is a Japanese comedy! Thank goodness for Netflix. And for Wikipedia, the Google Art Project, and the public domain. There's so much to learn, I don't even know what I'm missing! I have a new poem out there in the world, "Making a Date," based on a photograph taken by Eudora Welty in Grenada, Mississippi in in 1935. It's in the new issue of the museum of americana, a fabulous literary journal that is celebrating Americana in creative ways. 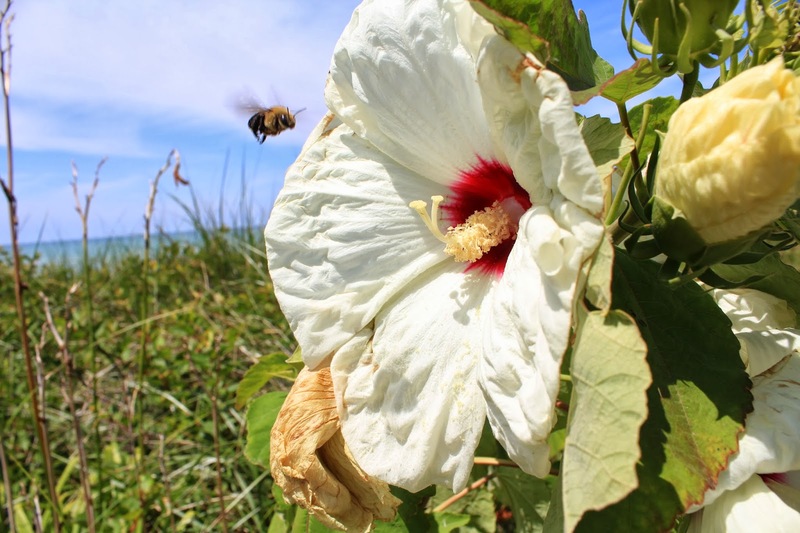 And how about this bee making a date with a hibiscus in a fabulous photo taken by my daughter this past summer in Michigan?! For more of her pix, go here! 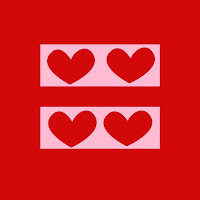 It's a month of praise and thanksgiving, and today I'm thankful that the marriage equality bill in Illinois was passed in House and Senate and sent on to the Governor to be signed into law. Love and equality for all. 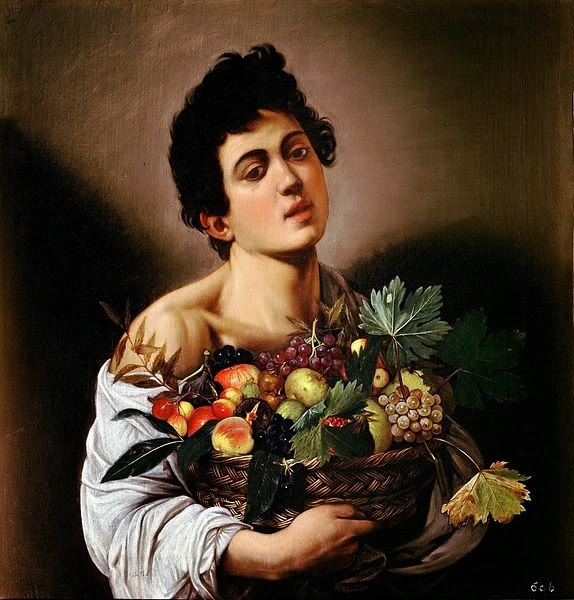 "Praise Your Life" is the first poem in the new poetry feature up at Escape Into Life today, by Andrea Potos, with art by Caravaggio! I so enjoyed The History of Love, by Nicole Krauss, and discussing it with my book group last night, with plenty of red wine, snacks, and beer. One of our usual members was off celebrating (and/or resting) after the important vote in Springfield! She and her partner have patiently and relentlessly spoken to legislators about marriage equality, and now here it is, at hand! Thank you, Suzie and Danielle! And here's a lovely young man bringing a basket of fruit to your Thanksgiving table. Thank you, public domain! The randomness continues. 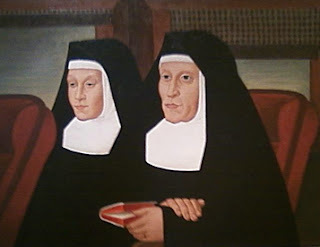 Today, Collagemama, a wonderful, whimsical blogger in Texas who often comments here, sent me this picture of nuns on the train. (She was responding to yesterday's post, Nuns on the Bus.) The painting, called The Chair Car, is by Williamson Gerald [Jerry] Bywaters, an artist from Paris, Texas. Paris, Texas is a real town and a film (that was not filmed in Paris, Texas.) This summer the Nuns on the Bus went to Houston, Dallas, Austin, San Antonio, Laredo, and El Paso, Texas, but not Paris, Texas. And many other cities and towns across the U.S.A. Sister Simone Campbell, one of the nuns on the bus (not on the train), led worship today at New Covenant Community, and it was a packed church! She was inspiring, reverent, down to earth, and fun. She explained the loaves and fishes--the miracle was sharing (the women had packed food, of course). 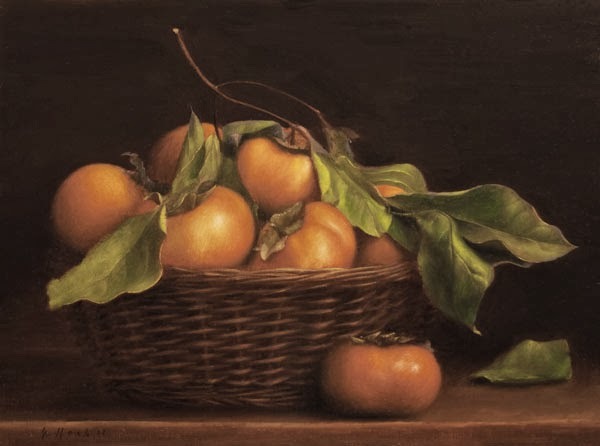 She mentioned stomach acid, in regard to St. Paul's epistle on the metaphor of the body of Christ. She advocated talking to people in the line at the grocery store. And she read more of her poems to us. 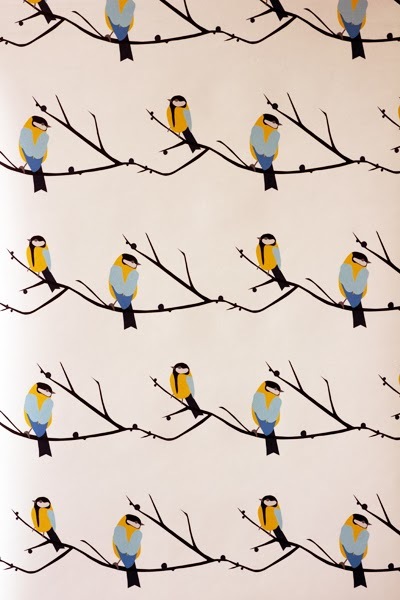 Plus, remember wallpaper? 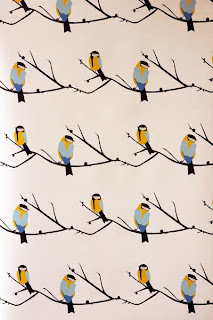 She talked about wallpaper! Remember "in a lonely place"? Well, she spoke of being "in this lonely place" of life on earth and the need for community, for radical acceptance and love. It all made sense, and I had that lovely weird feeling of everything being pertinent, everything coming together in a delightfully unexpected way. Which, I admit, is how I often feel. It was just nice to get that Nuns on the Bus bump. 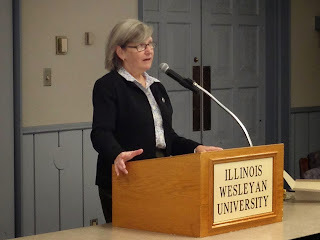 What a joy to hear Sister Simone Campbell speak last night at Presser Hall at Illinois Wesleyan University. She is here for 3 days thanks to the Jim and Gwen Pruyne Lectureship, an outreach of New Covenant Community. NCC is a progressive Protestant church, and Sister Simone is part of the progressive Catholic Church, and everyone involved seems to share interfaith values and a commitment to social justice and universal compassion. Plus, Sister Simone is hilarious in person. She was a guest on The Colbert Report and got the "Colbert bump." Or vice versa, as I'm sure Stephen Colbert would agree! As she explained in her talk last night, she and her fellow "nuns on the bus" probably got the Vatican bump--by annoying the Vatican. And when the Vatican draws attention to your cause, you get noticed. The nuns on the bus (who vary all along the route) were on a cross-country journey, literally by bus, to share their message about the issues of economic justice, immigration reform, peace, and affordable healthcare.You can read more about these and other causes they support, including ecology, here on the Issues page of the Network website. Network itself is a national Catholic social justice lobby. 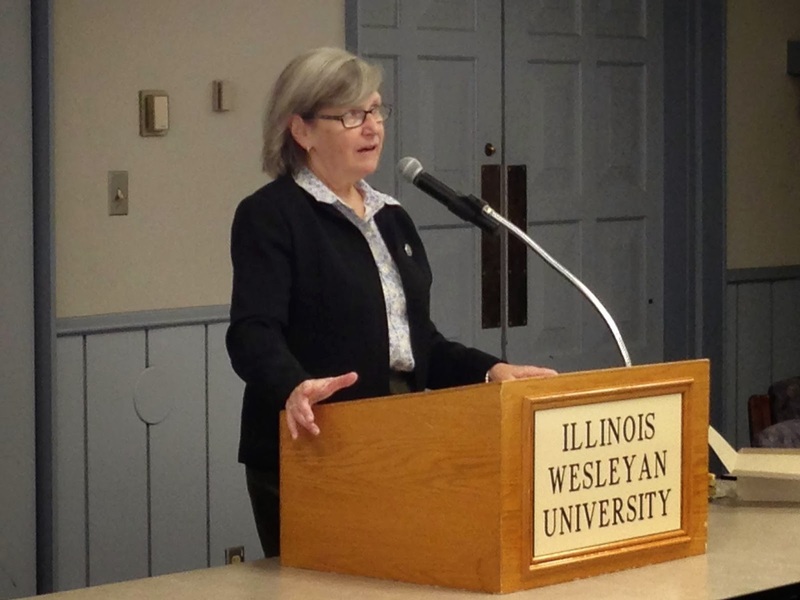 Here is Sister Simone speaking to students yesterday at Illinois Wesleyan. You can hear her tomorrow at New Covenant at 10:30, 210 W. Mulberry, Normal, IL, where she will be leading worship and reading a promised poem! Yes, she's a poet! And for those of you who were wondering--I didn't forget you!--whether blue roses exist in nature, here is your answer at Natural Garden! And that, my friends, is a Random Coinciday in the blog.